Today we live in a time when free trade has become a major component of the international economy. The European Union, EU, was originally a free trade project, for instance. During the 18th century the way to economic prosperity was seen as something entirely different. The economic doctrine prevailing in those days is called mercantilism. From the end of the Middle Ages through the 19th century, mercantilism was the totally dominant economic school of thought in Europe. The source of wealth for a country, according to the mercantilists, was above all foreign trade. It was through trade that the country obtained gold and silver, and it was precisely these precious metals that measured the country’s wealth. Fire and air machine at Dannemora mines from the late 1720s. 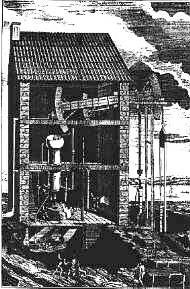 This was the first attempt in Sweden to power mine pumps with a steam engine. Copper engraving by E. Geringius in Mårten Triewald’s Brief Description of the Fire and Air Machine at Dannemora Mines (1734). But a nation’s assets also included the size of its population: the more citizens there were, the better off the country was. In France, for example, parents were granted tax relief after the ninth child, which was fully in line with the mercantile population policy. Other income could be collected by the state in the form of customs tolls, both at borders and within the country. This explains a number of Swedish place names like Norrtull (North Toll), Skanstull, and Danvikstull, etc. Mercantilists also pointed out that the state should be actively involved in economic policy. Via decrees the state could subsidize businesses, for example. Generally the importance of manufacturing (that is, the emerging industries) was stressed at the expense of other activities like agriculture, forestry, and fishing. During the Age of Liberty in Sweden, mercantilism was primarily associated with the Hat Party, which was in power 1738–1765. Sweden was an agrarian society, which explains why Swedish mercantilists also felt that agriculture was important. See further In the service of agriculture.